Artist Emmanuel Fremiet (1824-1910) sculpted these bronze groups, ranging from 8' and 6'8" high. The pieces of art can be found in the enclosed patio of Krannert Art Museum. They were a gift of Stacy B. Rankin in 1959. These statues came to the Urbana campus by mistake with the purchase of the contents of Lorado Taft's studio in 1937. After years of being kept in storage and following prolonged negotiations, they were donated to the university in 1959 by the heir of the original owner. 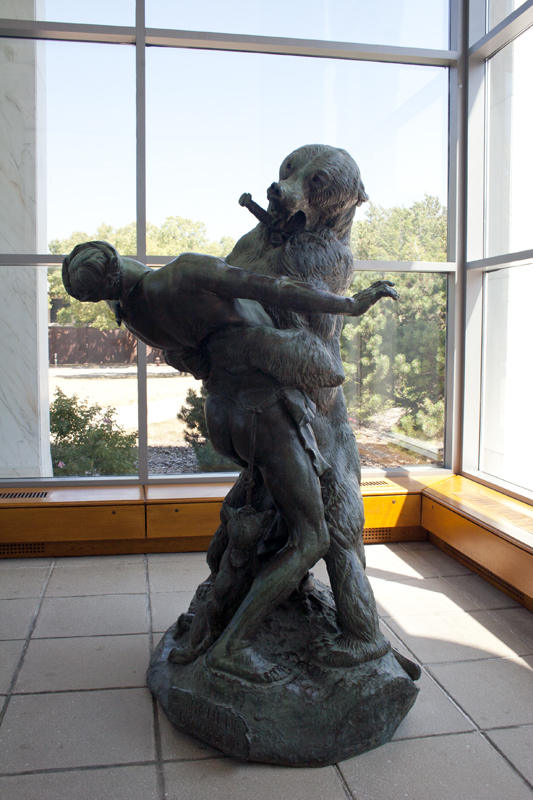 On display since then in Allerton Park woods, in the Krannert Art Museum, and in a major four-city national traveling exhibition, "The Romantics to Rodin", they are back again at UIUC. Beautifully realized in bronze by the accomplished French sculptor Emmanuel Fremiet, the two powerful groups represent a standard of late nineteenth-century academic and popular taste that favored works contrasting bestial force with human figures of grace and vulnerability: angry beasts acting in accordance with their animal instincts, victims as well as perpetrators of terrifying violence, statues at once repulsive and sentimental. 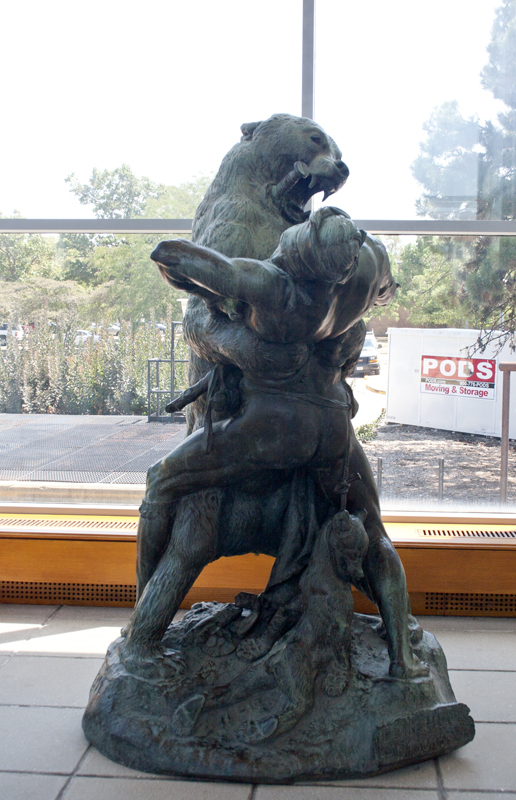 When Fremiet first showed Bear and Man of the Stone Age at the 1885 Salon in Paris, it was made of plaster and listed in the official catalogue as Ours et Homme de l'oge de pierre. 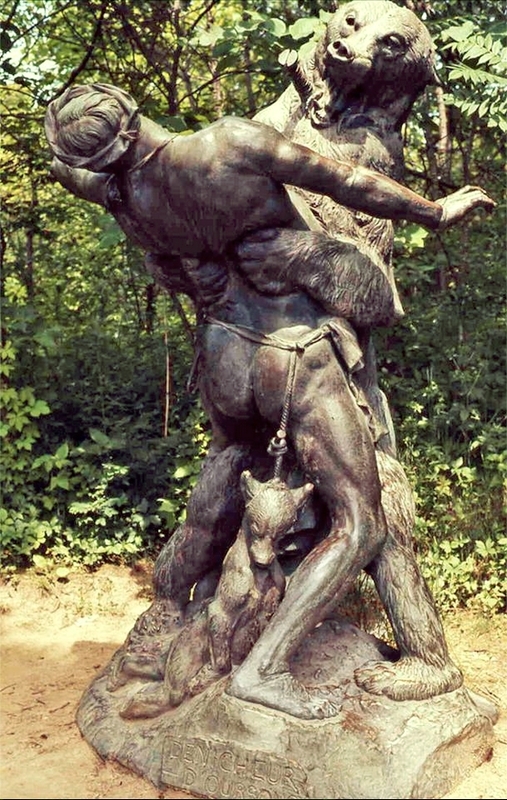 But to make the deadly serious subject matter wholly unambiguous, as if somehow in the abundance of telling details the story might somehow be misunderstood, the artist imprinted the words "Denicheur d'Oursons" on the statue-literally "Snatcher of Bearcubs from Their Nest." Besides our original bronze, another cast of the same size is at the Jardin des Plantes, Paris, where children enjoy climbing over it. This is no decorative statue; the tragic scene captures a moment of raw jungle justice in which all participants die helplessly. 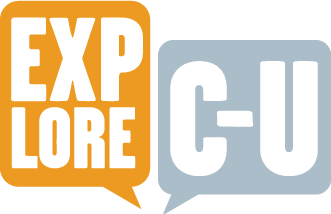 The cub, a pathetic, humanlike corpse, hangs by a tight noose from the burly trapper's belt. The trapper's closed eyes, claw wound, and last gasping breath herald an imminent demise. The furious mother bear, mortally wounded by the heavy dagger thrust in her throat, roars mightily and retaliates in a crushing death squeeze. The Gorilla Carrying off a Woman won a gold medal when displayed in plaster at the 1887 Salon. An earlier version of the same subject, but with a female gorilla dragging off a cadaverous woman, caused a sensation at the 1859 Salon. According to one Fremiet biographer, "emotional workmen, mostly Belgian with childlike minds," deliberately destroyed it when transporting it back to the artist's studio. The sculptor cast three other bronzes like it; they are in the Menagerie of the Jardin des Plantes and in the museums of Nantes and Melbourne. A slithering snake at the statue's base is the only element in the overstated drama that might be construed as symbolic, since its association with evil is generally recognized. 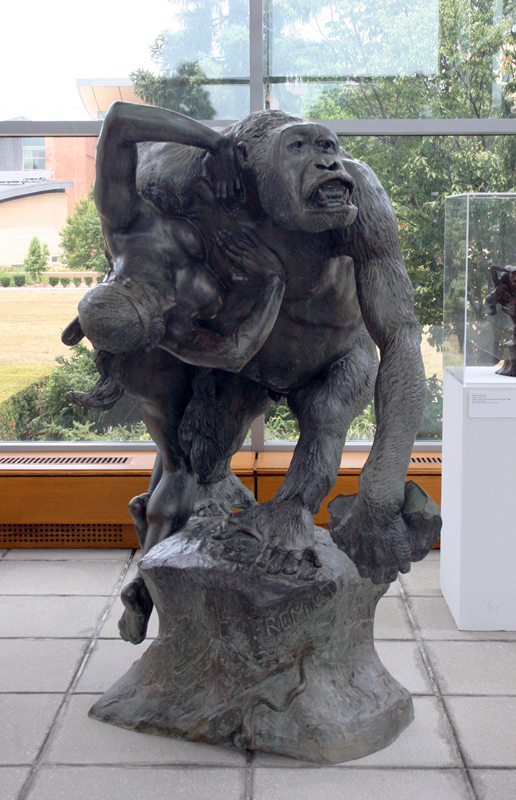 The hapless woman-attired only in a furry loincloth (very like the gorilla's own coat), her hair adorned with a large gorilla jawbone with teeth intact, a decorative amulet, and another ornament primitively carved with a face-feebly tries to push her vengeful abductor away. In the sculpture's original state, an arrow dangled conspicuously under the animal's shoulder, but it has long been lost. Fremiet's considerable reputation arose from the anatomical accuracy of his works and his attention to archaeological details, his innovative techniques in rendering life-size animal groups, and his successful selling of copies and reproductions. Among his major works are the Wounded Dog in the Louvre, Faun Playing with Bear Cub in the Luxembourg, a gargantuan Elephant in the Trocadero, and the gilt-bronze Joan of Arc in the Place des Pyramides. 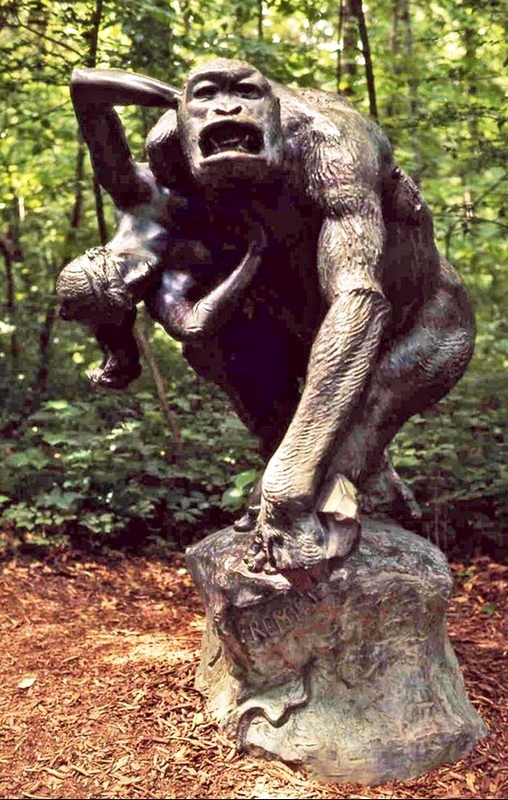 Gorilla Carrying off a Stone-Age Woman, 1887,” ExploreCU, accessed April 21, 2019, https://explorecu.org/items/show/38.